This article is about the bass guitarist. For the Gaelic football player, see Billy Sheehan (Gaelic footballer). For the Australian rugby union player, see Billy Sheehan (rugby union). For the American lawyer and politician (1859-1917), see William F. Sheehan. William "Billy" Sheehan (born March 19, 1953), is an American bassist known for his work with Talas, Steve Vai, David Lee Roth, Mr. Big, Niacin, and The Winery Dogs. Sheehan has won the "Best Rock Bass Player" readers' poll from Guitar Player magazine five times for his "lead bass" playing style. Sheehan's repertoire includes the use of chording, two-handed tapping, right-hand "three-finger picking" technique and controlled feedback. Billy Sheehan's first electric bass was a Hagström FB[lw 1], which was soon joined by a Precision bass similar to Tim Bogert's. After acquiring the Precision bass, he removed the frets from the Hagström. [lw 2] Over the years, he heavily modified the Precision bass as well, scalloping the five highest frets, adding a neck pickup and additional support for the bolt-on neck, which Sheehan considers its greatest weakness. The neck pickup was added for what Sheehan referred to as "super deep low end" modelled after Paul Samwell-Smith of the Yardbirds and Mel Schacher of Grand Funk Railroad. The Gibson EB-0 type pickup in the neck and the original split Precision bass pickup each have their own separate output jacks on the bass itself, allowing for control of the tone via the bass. The Precision bass has since been retired, but Sheehan still affectionately refers to it as "The Wife". Sheehan's signature Yamaha Attitude bass is patterned after this instrument. Sheehan also uses two amps to achieve his signature tone, one with full distortion and high pass filtering to sound more guitar-like, and one super-clean for the low end of the neck pickup. Sheehan's first full-time band was Talas, a power trio with Dave Constantino on guitar and Paul Varga on drums. The band played a mixture of cover songs and original material, and all three instrumentalists alternated on lead vocals. Talas was a popular local band in Buffalo for over a decade, attaining a cult status which spread into the northeast US and into Canada. In 1978, Talas released their eponymous debut album, which generated the regional hit single, "See Saw". It was during this time that Sheehan wrote "Shy Boy" (later re-recorded with David Lee Roth), and "Addicted to that Rush" (later re-recorded with Mr Big). In the late 1970s, Sheehan also played in a band called Light Years with drummer Ron Rocco who had earlier played in a band called Black Sheep with Foreigner singer Lou Gramm in Rochester, NY. After Sheehan returned to Talas they opened a show for UFO in Buffalo. This led Sheehan to an association with guitarist Michael Schenker and also helped land him the job touring with UFO in 1983. Talas' first national exposure happened in 1980, when they opened thirty shows for Van Halen. However, success was elusive, and even as their brand of what came to be known as "glam metal" gained popularity over the next few years, Talas remained an unsigned act, partly due to poor management. [lw 3] They independently released their debut eponymous "Talas" LP on Evenfall Records (reissued by Metal Blade) and then "Sink Your Teeth into That" on Relativity Records. In the early 1980s, Sheehan became involved with the proto-thrash metal band Thrasher, during this time he shared the stage with future Anthrax guitarist Dan Spitz. His involvement with Thrasher did not last long but he did play on the self-titled LP, reissued on CD in 2008. Sheehan toured with PSMS (Portnoy/Sheehan/MacAlpine/Sherinian), an instrumental supergroup, in the second half of 2012. Sheehan, along with Portnoy and Richie Kotzen, recorded the debut album for their new band The Winery Dogs in August 2012. The self-titled album was released on May 5, 2013 in Japan, and July 23, 2013 worldwide. Their second album Hot Streak (album) was released in 2015. In August 2017, he joined another band with Portnoy, a progressive metal supergroup named Sons of Apollo and also featuring keyboardist Derek Sherinian, vocalist Jeff Scott Soto and guitarist Ron "Bumblefoot" Thal. Sheehan has been an active member of the Church of Scientology since 1971. ^ "...your 00:31 first electric bass was a Hagstrom FB 00:33 true true"
^ "...after acquiring your first 00:57 fender precision bass you removed the 00:59 frets from the Hagstrom. I did." ^ "02:04 [...] I'm sure was a contributing 02:06 factor [...] but [our manager] it wasn't 02:08 horrible"
^ a b ""Billy Sheehan - Biography & History - AllMusic"". Archived from the original on March 27, 2018. Retrieved July 5, 2018. ^ "Sheehan's Bio on his Official Site". Billysheehan.com. Retrieved August 9, 2011. ^ a b c Graham 'Gruhamed' Hartmann (Interviewer), Billy Sheehan (Interviewee) (October 14, 2015). Billy Sheehan - Wikipedia: Fact or Fiction? - YouTube (Video). Youtube: Loudwire. See notes, group "lw", for auto-generated transcripts and time. Retrieved July 5, 2018. ^ "Gear article". Billysheehan.com. Retrieved August 9, 2011. ^ Prokofiev, Dane (October 6, 2012). An Interview with Tony MacAlpine (6th October, 2012)" on YouTube. Retrieved 2012-10-19. ^ "Portnoy, Sheehan, MacAlpine, Sherinian To Tour Europe and Asia, Fall 2012". tonymacalpine.com. 2012-07-27. Retrieved 2012-10-11. ^ Cavuoto, Rob (December 2013). "Tony MacAlpine Interview: New DVD Release Live In Tokyo" Archived March 29, 2014, at the Wayback Machine. Guitar International. Retrieved 2014-03-01. ^ Portnoy, Mike. "MP Studio Diary for Portnoy/Sheehan/Kotzen sessions – Day 1". Retrieved April 11, 2013. ^ Portnoy, Mike. "MP Studio Diary for Portnoy/Sheehan/Koten sessions – Day 14". Retrieved April 11, 2013. ^ "THE WINERY DOGS: Official Logo, Band Photo Unveiled". BLABBERMOUTH.NET. Retrieved April 11, 2013. ^ "Hot Streak - The Winery Dogs | Songs, Reviews, Credits | AllMusic". AllMusic. Retrieved August 4, 2016. ^ Munro, Scott (August 1, 2017). "Supergroup Sons Of Apollo announce debut album". TeamRock.com. Future Publishing. Retrieved August 1, 2017. ^ "~The Complete Package~". Global Bass online. Retrieved February 28, 2008. 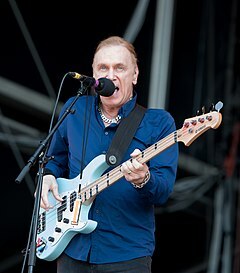 Wikimedia Commons has media related to Billy Sheehan.